Welcome to the Dell by the Sea, Chapel St Leonards, Skegness, Lincolnshire. This large holiday home is fully equipped for 10 people and has been in the family for a number of years. On a quiet road, it is only ½ a mile from the village of Chapel St Leonards and near to Skegness, Anderby Creek, Sutton on Sea and Mablethorpe. 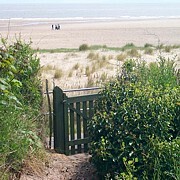 It is lucky enough to have a private path straight through the sandhills on to a quiet sandy beach, which has good walking for all ages and where children can run freely. The detached house, which is full of character, is ideal for friends and family gatherings. It has 5 bedrooms, a well equipped kitchen, spacious lounge and separate dining room. There are many places to visit nearby including Skegness, Gibraltar Point Nature Reserve, Fantasy Island at Ingoldmells and the Lincolnshire Wolds and market towns of Alford, Louth and Horncastle. There are shops, pubs and restaurants within an easy half mile walk. Children’s activities include Hardy’s Animal Farm at Ingoldmells, Mablethorpe and Skegness Seal Sanctuaries and Skegness Stock Car Stadium at Orby. The sheltered garden allows for relaxation in a quiet location. A log cabin in the grounds is occasionally owner occupied. Two well behaved pets welcome downstairs.